There is nothing better than a Northern Territory road trip when you travel to Australia. Home to spectacular gorges, pretty as a picture swimming holes and abundant wildlife, the area also has a rich aboriginal history and is the perfect place to learn about their ancient culture. Our outback road trip itinerary will take you to the best destinations in three Northern Territory National Parks located in the Top End: the UNESCO World Heritage Listed Kakadu National Park, Nitmiluk National Park and Litchfield National Park. 1 Tour or self drive the Northern Territory? Tour or self drive the Northern Territory? When we first decided to explore the Top End, I have to admit I was nervous about a self drive road trip – it is the Australian Outback after all! But the reality wasn’t scary at all. The driving conditions were perfectly manageable for inexperienced 4WD drivers like us. The 4wd camper we rented handled the terrain easily. The best thing? A self drive road trip gives you so much more freedom to explore the Northern Territory destinations at your own pace. Our best tip? We recommend renting a campervan and taking a Northern Territory road trip through the Top End to experience the very best of the Australian Outback. We share more tips on choosing a vehicle for your Northern Territory road trip here. If you absolutely cannot do a self drive road trip, we strongly recommend you look at the multi-day tours instead of a day trip, especially for Kakadu National Park. There are many tour companies offering day trips from Darwin, but they involve a lot of driving. The Northern Territory is a big place and driving distances can be huge! So how long do you need to explore the Top End? It depends how much you want to see and how often you want to move. More time is always better, but we think a 2 week Northern Territory itinerary gives you a good amount of time to see the best of the Top End. It is possible to explore the National Parks more quickly, but there are so many things to do in the Northern Territory. It is a long way to go so you may as well make the most of it, right? You will notice that most stops are one night stays. We decided to camp at a new site each day rather than base ourselves at a single campground. It saves a lot of travel time and also means you can experience more unique places during a two week road trip. This itinerary is a loop starting and ending in Darwin. You could reverse the order of the itinerary. This itinerary can easily be modified to be part of a one-way trip to or from Alice Springs or even as part of a longer road trip to Western Australia. There are many campervan hire options in Darwin, with all of the big rental companies offering vehicle rentals out of Darwin. There are many 2WD options but we recommend renting a 4WD camper to give you more freedom to explore off the main roads, experience the outback with fewer people and stay in smaller campgrounds in spectacular locations. Another option would be to rent a 4WD car and take tents and camping equipment with you. Expert Tip: Campervan rental prices jump significantly during school holidays, so if you have flexibility to travel outside of those dates, you will save a lot of money! Whichever way you decide to travel, ensure the rental agreement allows you to travel on dirt roads so you can see the Australian Outback at its best. We rented a 4WD Landcruiser and were very happy with our choice. The car was easy to drive on dirt roads, through shallow river crossings, over bumpy and sandy tracks. The roof tent was quick to set up each day and all bedding and kitchen equipment was provided too. Our itinerary is broken down day by day with the highlights, campground details and key information listed for each day. You can read all our best tips for planning a Northern Territory road trip here. We share our Outback Australia packing list here. With everything from clothes to bags to cooking equipment and lighting, you can be confident you have a complete packing list to plan your trip. Note: All prices listed throughout the itinerary are in Australian Dollars. Pick up your 4WD in Darwin and drive straight to Kakadu National Park. It is an easy drive to Jabiru on paved roads. On the way out of Darwin make sure to stop at the town of Coolalinga to stock up on groceries. You will want to stock up on as many non-perishables as you can squeeze into your vehicle before you leave Darwin. There is only one small grocery store within Kakadu National Park, in the small town of Jabiru. Also note that takeaway alcohol cannot be purchased within Kadadu National Park, so if you would like to have drinks on hand you will need to purchase them in Darwin. Don’t forget: Purchase your Kakadu National Park Pass. A family pass costs $100. A single adult costs $40. The pass can also be purchased at the Bowali Visitor Information Centre when you arrive. We caught sight of our first crocodiles cruising the South Aligator River and were excited to watch the landscape change quickly from urban to outback. If you have time, head to the Bowali Visitor Information Centre. Otherwise you can do this first thing the next day. Kakadu Lodge is a great stop for your first night in Kakadu National Park. It is a large campground with cabins, unpowered and powered sites, a pretty lagoon style swimming pool and an onsite bar and restaurant. We paid $32 for a shady unpowered site. Give yourself adequate time to set up camp on the first night. We got more efficient at setting up and packing down during our 2 week road trip but it takes time to learn the ropes. We were able to set up the tent in around 15 minutes. Pack down was a little longer, around 20 minutes. Watch our timelapse video setting up the roof tent here. Before heading to Ubirr, we recommend you stop in at the Bowali Visitor Information Centre. The helpful staff can provide details on which campsites and 4WD tracks are open. They also have information on the excellent and free ranger-guided programs. Activities include guided walks, talks and art activities with local aboriginal artists. We adapted our itinerary to fit in with some of these activities and I am glad we did because they are great. Note that many of these programs are scheduled during the week, so you may need to plan your itinerary around these times. The Visitor Centre also has displays about the local wildlife, plants and aboriginal culture which is a great introduction to the Park. The Visitor Centre is open every day from 8am – 5pm. We stopped in at the Merl Campground to join a basket weaving session run by two local female aboriginal artists. Over two hours the kids watched and learned how the pandanus leaves are stripped, they helped make the colourful dyes from local plant roots and flowers and made their own bracelets using the dried pandanus. It was a hands-on, interactive learning experience and one we highly recommend. While in the area make sure to visit Cahills Crossing. Located on the East Alligator River, Cahills Crossing is one of Australia’s most dangerous bodies of water. It is a tidal river crossing into Arnhem Land and has been the site of several fatal crocodile attacks. It is a challenging crossing for some, evidenced by the rusted upturned cars downstream. We watched cars make the crossing and also watched men risk their lives standing shin deep in the river to fish off the causeway despite the crocodile warning signs. We saw a number of crocodiles in the area and couldn’t believe they were fishing! The highlight of any visit to Ubirr is the UNESCO World Heritage listed Ubirr Rock Art site. It is one of the best things to do in Kakadu National Park. We joined a free ranger-led walk through the site, which ran from 4.10pm – 6.10pm. The walk included 4 info sessions with breaks in between to freely explore the surrounding area and the rock art. After admiring the rock art, head to the lookout for sunset. You will be rewarded with spectacular views across the floodplains and to the distant escarpments. We stayed at Merl Campground. It is a pretty campground with plenty of space and shade. There is drinking water, flush toilets and hot showers available for $38 for a family on an unpowered site. Warning: The Merl campground backs onto a swamp and the mosquitoes at night in this campground were unlike anything we have seen anywhere in the world. There were swarms of mosquitoes after sunset. So much so we found it difficult to cook and eat dinner. Despite spraying ourselves with mosquito spray and covering up, we were still being bitten through our clothes. We could see them everywhere and could hear them buzzing all around us. When we woke in the morning we could see dozens of mosquitos sitting on the flyscreens, looking in at the tasty meal they missed out on!! The very next day, on advice from the ranger, we bought a Thermacell Mosquito Repeller. It wasn’t cheap, but it works! Thankfully we didn’t experience mosquitoes so bad anywhere else during our trip, but we used the Thermacell most nights to keep the pesky mosquitoes away. When we turned the device on, there was not a mosquito to be seen. Best purchase ever! Apart from self-catering you only have one option, but it is a great one. Stop in at the Ubirr Border Store on your way out to or back from the Rock Art site. As well as serving snacks and delicious icy cold drinks they serve up great Thai food too. The yellow and green curries were delicious. The next stop in our Northern Territory road trip is Cooinda, on the south side of Kakadu National Park. Cooinda is a great base from which to join a cruise on Yellow Water Billabong. Don’t forget to stock up on groceries and fuel at Jabiru on the way through. On the way to Cooinda, take a detour to another UNESCO World Heritage Rock Art Site known as Burrungkuy (Nourlangie). There are ranger led programs available here, but this time we explored the site on our own. The x-ray rock paintings are very impressive and easily accessible via a short walk up through shaded rock shelters. If you have time, check out the nearby Anbangbang Billabong (a nice spot for lunch) or walk up the Nawurlandja Lookout for spectacular views cross the escarpment (best at sunset). A cruise along the Yellow Water Wetlands is a must for any visitor to Kakadu National Park. The guides are very knowledgeable, the floodplain is teeming with birdlife, crocodiles and lush vegetation, and the colours of the landscape were spectacular. It isn’t a cheap activity at a whopping $300 for a family of 4, but it was one of the highlights of our Northern Territory road trip. We stayed at the campground at Cooinda Lodge. Cooinda Lodge offers rooms as well as a campground with powered and unpowered sites. There is a pretty billabong style pool to cool off and a large restaurant and bar for those who don’t feel like cooking. We paid $36 for an unpowered site for the family. Today make your way to Jim Jim Falls, one of the most impressive gorges in Kakadu National Park. Don’t forget to top up groceries, drinking water and fuel at the small general store at Cooinda Lodge. Access to Jim Jim Falls is via a dirt/gravel road for about 50 kms (30 miles). I couldn’t believe the colours of the landscape around us as we drove along. Brilliant red dirt, clear blue skies, lush green palms, charred black ground from recent fires. It is a dramatic and stunning landscape. The road is wide but corrugated and was generally in a good state of repair when we visited in late June. We travelled at around 50-60km/hr without any trouble. Once you reach the Garnamarr campground the road narrows for the last 8 kms (4.9 miles) to the Jim Jim Falls carpark. A 4WD is required for this last section. The track crosses a number of shallow causeways and was sandy in places, but our Landcruiser had no problem navigating the terrain. The trailhead to Jim Jim Falls is at the carpark where there are basic pit toilets available. The 2km (1.2 miles) return trail is very pretty as it meanders through monsoon forest, across large boulders and along a creek that gradually narrows into a steep and jaw dropping 200m (1/8 mile) tall gorge. The kids loved scrambling up over rocks, although they were nervous at how close the trail was to the creek considering the large crocodile warning signs they had just read at the carpark! Jim Jim Falls is one of the most spectacular waterfalls we visited on our 2 week Northern Territory road trip and the trail can only be accessed during the dry season. I can only imagine how impressive it must look in the wet season with water pouring off the top. We spent an hour or two exploring the plunge pools and beach pool with brilliant white sand, paddling in the water, and Matt braved a chilly swim out to the wispy waterfall, all the while thinking about the croc traps we had sighted on our way in! There is another walk to the top of the falls. It is listed as a difficult 5-6 hour walk on steep terrain over 6kms (3.7 miles) return. If you want to take the walk, ensure you leave early and take at least 3 litres of water per person. Camping is available close by at the Garnamarr campground. We had wonderful views of the red stone escarpment from our site. Showers and toilets are available and we paid $20 for the family. Expert Tip: We suggest stopping in at the campground first, choosing a site and leaving table/chairs at the site so that you can return later in the day and know you have a site secured as the site did fill up. We share more tips on campgrounds here. The drive from Jim Jim Falls to Maguk Gorge is again mostly on gravel/dirt roads. The road into Maguk Gorge was heavily corrugated, but completely manageable in the 4WD. The last 1km from the campground to the car park was very sandy and a high clearance 4WD is essential. We saw enormous termite mounds everywhere along the sides of the road – able to withstand fire, rain, the heat and the dry – they are impressively tall buildings for these little creatures. The walk from the car park to the gorge is shaded through monsoon forest, again along a small creek bed, then along small beaches and across smooth large rocks before arriving at the swimming hole. Maguk is a very pretty waterhole with crystal clear water, surrounded by sandstone cliffs and pandanus plants. It was an instant favourite. We took lilos to swim out to and under the waterfall. The kids searched for fish and found rocks to jump off into the water. Maguk is incredibly peaceful, not very busy and we didn’t want to leave. So we came back in the morning for another swim before we left! It is possible to walk to the top of the waterfall where there are a number of smaller plunge pools. To reach the top of the falls, stay on the left hand side of the creek and follow the track to the top. We stayed at the small campground at Maguk, about 1km before the carpark to the gorge. Note there is no drinking water or showers available. The toilets are basic pit toilets. Be sure to reserve your spot with a table/chair before making your way to the gorge for a swim. We paid $15 for a family. The last 35km of this drive is along gravel/dirt roads. We picked up firewood along the way and enjoyed the views towards the escarpment. Gunlom is one of the most famous destinations in Kakadu and for good reason. The waterfall plunges into a large swimming hole. There is a small sandy beach and grassy picnic sites nearby. But it is the plunge pools ABOVE the falls that make this such a memorable place to visit. Just a 500m steep walk to the top brings you to a set of gorgeous natural plunge pools, a natural infinity pool with spectacular views across the plains and even a narrow gorge to swim through. Our kids managed the walk easily in about 15 minutes, but it is a steep climb. The view from the top is simply out of this world gorgeous. The views at sunset are incredible. Where else can you swim in a pool with views like this, for free! It certainly beats many hotel roof top pool views! There is a campground right alongside Gunlom waterhole and it is a great spot to stay. Everything is close by. There is drinking water, flush toilets and showers available. All sites are unpowered. We paid $38 for the family. After a week of moving each night, we decided to stay 2 nights at Gunlom. With a nice campground and gorgeous plunge pools for swimming, we weren’t short of things to do for an extra day. There are also a number of walks close by for those seeking a bit more activity. Kakadu is home to a third of Australia’s bird species and I think all of them live at Gunlom! Each day we were woken by a cacophony of sound as the birds woke up for the day. The rocks at the top plunge pools are smooth and warm up through the day. They are the perfect place to laze away a few hours. We spotted a water dragon swimming through the gorge and the kids loved exploring all the little pools and finding higher and higher rocks to leap off into the water. Drag yourselves away from Gunlom and continue south towards Katherine. Umbrawarra Gorge Nature Park is a great place to break up the trip. On the way you will drive through the small town of Pine Creek. Top up groceries, fuel and water here. The Gorge is a detour off the main highway along a dirt track for about 20 kms (12.4 miles). Once you arrive at the small carpark, the trail through the Gorge is an easy 2km (1.2 miles) return walk along the creek, although it is possible to continue walking for much further up the gorge by scrambling over the rocks. The creek is lined with native paperbark eucalyptus, wattle, grevilleas and surrounded by deep red sandstone cliffs. In the early dry season it is possible to swim in the waterholes along the way, which we were lucky enough to do. We spotted kookaburras and parrots. To me this gorge was the perfect image of the Australian Outback. There is a small, basic campground close to the gorge. There is no drinking water or showers available. Pit toilet only. It is worth saving a spot before walking the gorge. We paid $7.70 for the family. The drive to Katherine is along the main highway where you will get to see the famous road trains. Used in remote outback areas to move freight across the country, these trucks often had 3 or 4 large trailers. To get to Nitmiluk National Park you will drive through the town of Katherine. You should stop to stock up on groceries, water and fuel here. 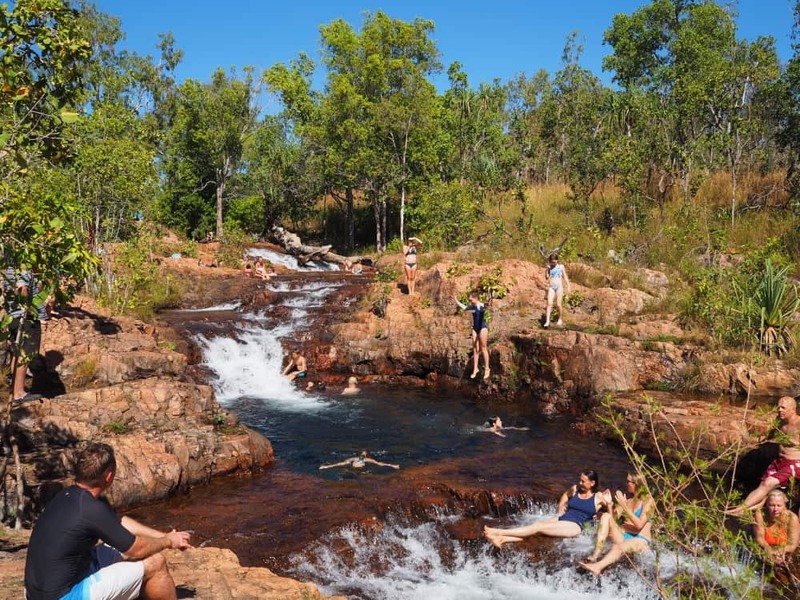 A great spot to stop on the way to Nitmiluk National Park is the Katherine Hot Springs. These natural thermal springs are on the banks of the Katherine River and are fed from a hole in the river bed upstream. You can enter the springs at a number of spots along a path and it fun floating down the river and across small cascades. There are more thermal springs further south at Mataranka and Bitter Springs, but as we were not traveling any further south this was a great stop to include in our Northern Territory road trip itinerary. Nitmiluk National Park is owned by the local Jawoyn People. It is a beautiful National Park where the main attraction is Nitmiluk Gorge. Carved out by the Katherine River for over 12km, the surrounding rock faces are over 70m high in places. It is made up of 13 separate gorges and there are many ways to explore the beauty of the gorge. Once you arrive, check in at the visitor information centre to receive maps and information on hikes, kayaking and river cruises. We stayed at the lovely Nitmiluk National Park Campground. While it was more expensive, at $50 per night for the family, we were based right in the park and didn’t need to travel for 3 nights. For those looking for something more luxurious, the Cicada Lodge is located within the National Park and makes a great option for a treat. There are a number of hikes and lookouts in the area as well as the opportunity to take a boat cruise, helicopter flights and even rent canoes to explore the gorge at a slower pace. We spent our two days in Nitmiluk Gorge hiking and canoeing through the gorge. We will share more information about this special place soon! As you make your way back to Darwin, a stop at Edith Falls is a must. The site is off the main highway and is an easy drive on paved roads. Edith Falls is within Nitmiluk National Park and is also the final stop for those completing the Jatbula Trail, a 62 km multi day day hike through Nitmiluk National Park. This walk is on our bucket list and looks achievable when the kids are older. Spend the day swimming at the top pools and in the billabong at the base of the falls. The kids loved paddling under the waterfall at the top pools, leaping off the rocks and attempting to swim under the waterfall. We are pleased we packed the inflatable surf mats as we all made great use of them during the road trip. You can download our full Outback Australia packing list here. There are a number of different walks starting from the campground for those seeking a longer hike, with many more pools along the way to cool off. There is a popular, managed campground at Edith Falls and you need to arrive early to secure a site. We arrived at 9am and already the sites were filling up. It is a grassy, shaded campground. There is drinking water, showers and toilets available. All sites are unpowered. We paid $30 for a family. On your way back to Darwin visit Litchfield National Park. Due to its proximity to Darwin it is one of the most popular places to visit in the Northern Territory. This also makes it one of the busiest and we noticed a marked difference in the number of people visiting compared to the places we visited in Kakadu National Park. Our first stop in Litchfield National Park was Florence Falls. After finding a campsite it was an easy 2km (1.2 mile) return walk to the falls along a paved path. The falls were very busy with visitors when we arrived. We had a quick dip and returned later in the day to explore a little more without the crowds. You can swim up to and under the waterfalls at Florence Falls which is loads of fun. There is also a lookout not far from the falls which gives you a great view over the falls and swimming hole. We stayed at the old 4WD campground at Florence Falls. There are two campgrounds at Florence Falls and both are easily accessible. There were toilets and showers available, but no drinking water. We paid $15.40 for a family. You should arrive by early afternoon to ensure you can claim a campsite. It is a very popular campground. For our final night in the 4WD camper we decided to make our way to Sandy Creek. Much quieter and a little out of the way, it was one of our favourite campsites and close to Tjaynera Falls. On our way to Sandy Creek we stopped at Buley Rockholes and Tolmer Falls. The drive into Sandy Creek is along a 4WD dirt track, and has a water crossing. The road had only opened in early July so there was still a bit of water across the road, at around 50cm depth. It made for an interesting water crossing, then through scrub land to a pretty campsite not far from Tjaynera Falls. The well-known Buley Rockholes are just up the road from Florence Falls. A series of cascades running over smooth, shallow rocks, it was fun to make our way down the cascade, find little waterfalls to sit under and rocks to jump from. It was very busy, so visit early or late in the day to avoid the crowds. We also stopped to admire Tolmer Falls from the lookout. The Falls aren’t open to the public, but you can view them from a lookout which is only 1km return walk from the carpark. It is a 3.4km (2.1 miles) return walk from the Sandy Creek campground along a flat trail that follows the creek to get to the falls. The swimming hole is very pretty, surrounded by impressive large overhanging sandstone cliffs and a tall cascading waterfall. There only a few people there and it was a very peaceful place to swim and play for the afternoon. 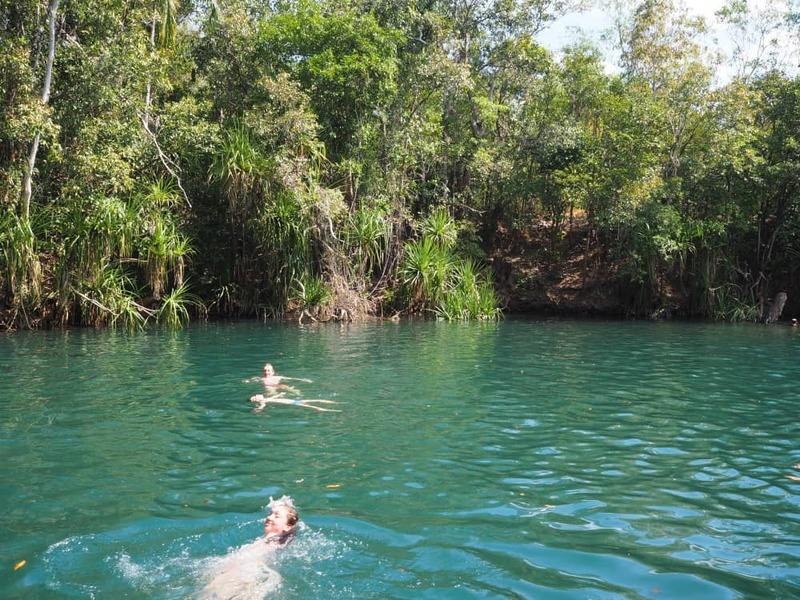 It was one of our favourite swimming holes in our Northern Territory road trip. There is a lovely, small campground at Sandy Creek. The campground has toilets and showers, but not drinking water. We paid $15.40 for a family. The campground is small and was full by mid-afternoon so don’t arrive too late in the day. There are two ways to get back to Darwin from Sandy Creek. One is back via Batchelor and along the main highway. The alternative is via Cox Peninsula Road which passes Wangi Falls and Berry Springs. We chose the latter route. There is a small section of dirt road, but it is wide and well maintained. You need to check whether the road is open all the way through, as it is often closed in wet season due to flooding. We stopped in at Wangi Falls early in the day on our way back to Darwin. It is a very popular destination (you can also camp at Wangi Falls), so we recommend you get there early, or camp at the site to explore the falls without the crowds. Don’t forget to take a dip in the small rockhole bored from the rock at the base of the waterfall on the left. I am not sure whether it was the crowds or the fact we had seen so many other gorgeous falls, but I didn’t rate Wangi Falls as highly as many of the others we had visited in our 2 week Northern Territory road trip. Another great stop on the return trip to Darwin, Berry Springs is a pretty thermal spring. Free to visit and bigger than the Katherine Hot Springs, there are a set of pools (upper, main and lower) of gorgeous turquoise water, surrounded by grassy picnic grounds. It makes a lovely stop for lunch and a swim before the final drive into Darwin. Note that due to its proximity to Darwin it can get pretty busy. We had just one day to explore and found there are plenty of things to do in Darwin. We enjoyed our visits to the Darwin Military Museum and the Museum and Art Gallery of Northern Territory. We will share more about Darwin soon! The easiest way to explore the city is by car. While it is a small city, the public transport isn’t great and it is easy to find places to park the car in the city and surrounding areas. Click here to book your Darwin rental car. There are number of different accommodation options available in Darwin. If you are looking for a campground, we recommend Darwin FreeSpirit Resort. If you are looking for a hotel, like we were (as we dropped our 4WD camper back on our arrival in Darwin), we recommend the Novotel Darwin Airport. The hotel is walking distance from the airport, which makes it very convenient for anyone with early flights in or out of Darwin. The hotel breakfast is available from 4am so you can get something to eat before an early morning flight! We booked a double queen room and were overjoyed to have a long warm shower, sleep in a comfy bed, enjoy a buffet breakfast and eat out for 2 nights before our flight home! Darwin has a great food truck scene. We ate both dinners by the ocean at different food trucks at East Point and NightCliff during our stay and loved eating out in the warm evening air and watching the sunsets Darwin is famous for. Food trucks we can recommend include Salty Plum Café, Needle in a Haystack and Cucina Sotto le Stelle. For a list of other food trucks and their locations see the schedule here. The Top End has two seasons: Wet and Dry. While the temperature changes little over the year, the difference is the level of humidity and the amount of rain. Dry season is May to October. Wet Season is November to April. Peak tourist season is during the dry season. We visited the Top End in the dry season in late June / early July. Daytime temperatures were in the low 30s Celsius (86 F) with overnight lows around 18 C (64 F). We were worried it would be too hot to hike and explore, but there are so many swimming holes that we never went a day without a dip to cool off. The lower humidity levels meant the temperatures were manageable as long as you planned to do the most energetic activities in the morning, and took a swim in the afternoon when the heat was at its peak. Accessibility to popular spots in wet season may not be possible. Some areas remain closed until June and even later so we recommend you check with the relevant the national park website for up to date information. Getting in and out of Darwin can be expensive, particularly during the peak season and school holidays. Flight times from domestic locations also vary, with many budget airlines departing and arriving through the night. Look at regional airlines such as AirNorth for daytime options if you don’t mind some additional travel time. There are many rental options available out of Darwin. We rented a 4WD Landcruiser with seating and beds for up to 5 people. We have used Lonely Planet Guidebooks for over 20 years. Buy your copy of Lonely Planet Northern Territory on Amazon. If you have any questions about our Northern Territory Road Trip please leave us a comment or contact us – we are happy to help! Love it? Pin and share your favourite image below on Pinterest! Thanks Kat. It was our first time to Outback Australia and I am 100% sure it won’t be our last. I was quite taken with the landscape. It is tempting to try and cover a lot of ground, as there is so much to see. We enjoyed the shorter drives on this road trip as like you said it meant there was a lot more time to enjoy each place. Excellent itinerary. Looks like you guys had a lot of fun. I had no idea there were so many swimming opportunities up there – they all look fantastic. The number of swimming holes was a pleasant surprise for us too! It made the heat bearable, which was great.